With a new year brings new projects and new hobbies. If one of those new hobbies is crafting with paracord, you've come to the right place. There are thousands of different projects, cord sizes, colors so you'll never get bored. Paracord is the perfect hobby to have since, not only will you never run out of projects, but it can potentially help you out in a bad situation one day. 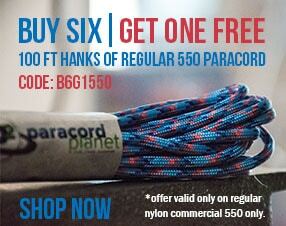 Paracord is one EDC item you will always want and is a great place to start. Here are 7 EDC projects to try for 2017. The paracord bracelet is one of the best places to start your paracord journey. 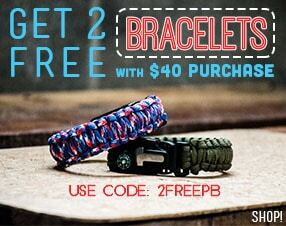 The Cobra is the most common bracelet and will give you 7-8 feet of usable paracord in an emergency. If you would like more bracelet tutorials, check our YouTube channel. A keychain is a nice project to do with scrap paracord since you'll only need a couple feet. There are a ton of different weaves that are great for keychains and so easy to put on your keys and carry every day. The hidden compartment keychain takes the traditional keychain up a notch. You can fit a couple of rolled up bills as well as matches, or anything that is skinnier than a pencil. Here is a great tutorial for a paracord hidden compartment keychain. Wrapping a flashlight handle with paracord has a few benefits. You'll have a much better grip on your flashlight as well has a good amount of usable, quick-deploy paracord. You already carry a leatherman every day so why not step it up and make a paracord pouch? Here is a great tutorial for a paracord leatherman pouch. Wearing a paracord watch also gives you usable paracord that is easy to carry, but may not be as quick to use as some of the other EDC options. Here is a great tutorial for a paracord watch. Wearing a paracord belt gives you the most amount of paracord with one of the easiest ways of carrying. It is the biggest project of these ideas, but if you have the time, it's a great one to do. Here a great tutorial for a paracord belt. What EDC item are you going to make in 2017?